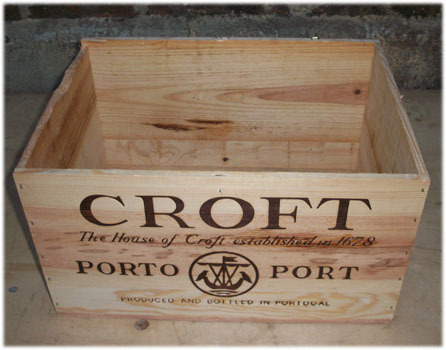 “Any time not spent drinking Port is a waste of time.”, Percy Crof. 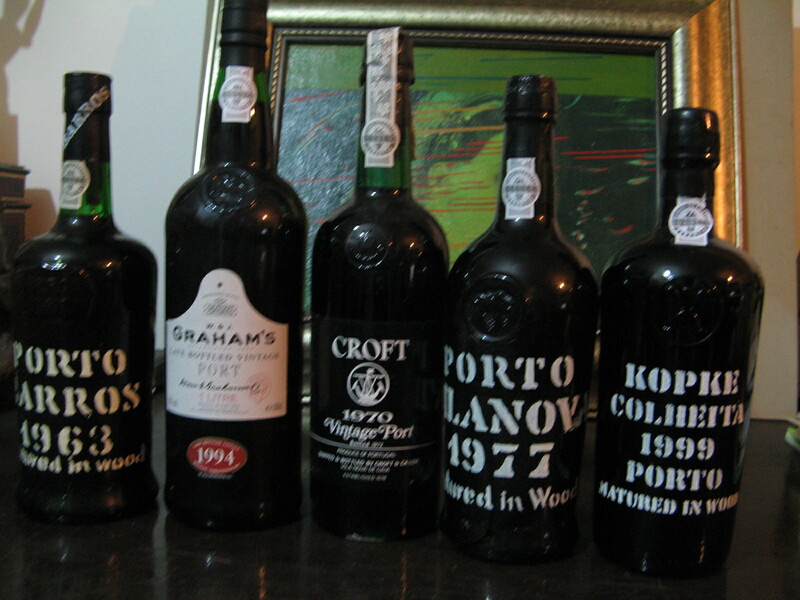 Port is regarded historically as a British drink especially as a traditional British Christmas drink. Surprising for a country that has embraced drinking Port since the 17th century, most English households buy just one Port bottle a year – mainly at Christmas! Do you see the French or Italians buy just one bottle of wine a YEAR??? Or Russians buy just one bottle of Vodka per annum? Still, most Brits drink Port as a festive drink on a festive season; Christmas. 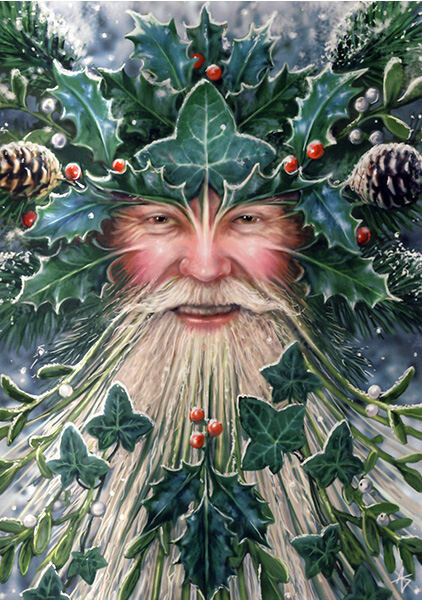 Christian religious, old pagan and secular themes are mixed in this holiday which is near or on the days of winter solstice. The ancient Egyptians decorated palm branches during the winter solstice to symbolize resurrection. 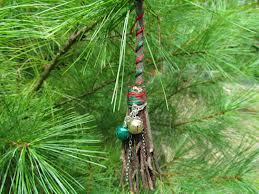 Ancient Greeks decorated evergreen trees in worship of Adonia, who was resurrected by a serpent. Romans covered their trees with metallic decorations and candles to honor Bacchus (our wine god), The ancient Germans decorated evergreen trees in worship of Woden. Apart from Christmas tree, and presents giving (of course), the holiday include a special meal. 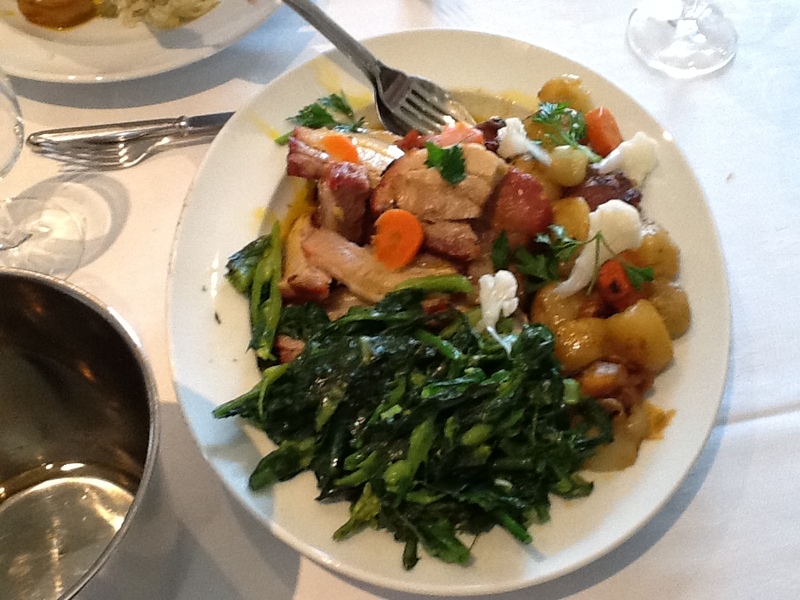 The Christmas dinner is the primary meal traditional for Christmas Eve and Christmas Day (at Lunch). Christmas dinner around the world may differ and the local traditional aspects affect the content the traditional products used and even the colours of the dishes, they all usually serve as symbols to commemorate aspects of life from religious to cultural and local even climatic points of view. 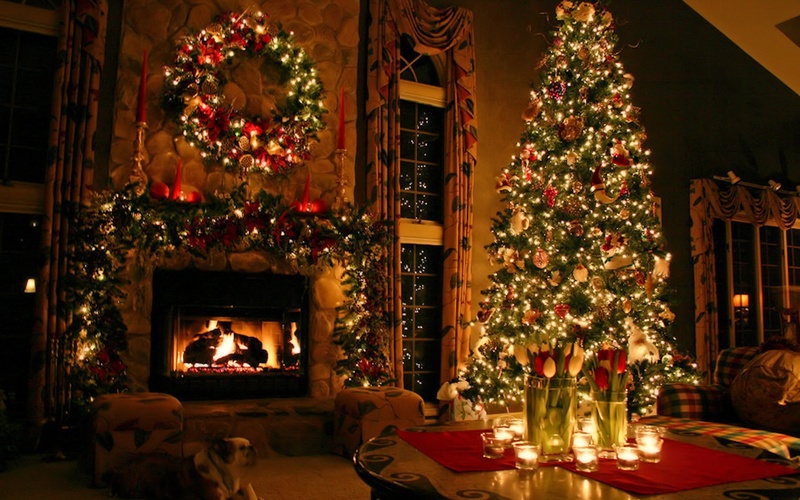 In the United Kingdom the main Xmas meal is usually eaten as lunch on December 25th. 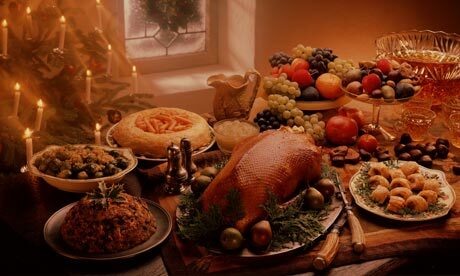 The dinner usually consists of roast turkey or better stills goose, duck, pheasant, or other Roasts, in medieval England, the main course was either a peacock or a boar, in fact King Henry VIII was the first English King to have turkey for Christmas. Served with stuffing, gravy and cranberry sauce or redcurrant jelly; bread sauce; Side veggies are traditionally: Brussels sprouts, parsnips and carrots (as if there was any other choice at the time the tradition was laid down and throughout the centuries and up to the late 1980’s). The dessert is Christmas pudding (or plum pudding), sometimes mince pies or trifle, with brandy butter…Port of different qualities may be served with each of the traditional dishes including the Roasts, but the best and most classic combination is Vintage Port served with a good quality Stilton or other blue cheese even well matured Cheddar, and Parmesan, accompanied by nuts mainly Walnuts, chestnuts, cashews, and hazelnuts that bring out the best in port. 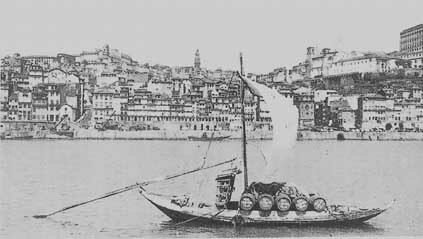 British wine merchants moved to a suburb of Oporto, Vila Nova de Gaia that lies opposite Oporto town and made it the true home to Port. 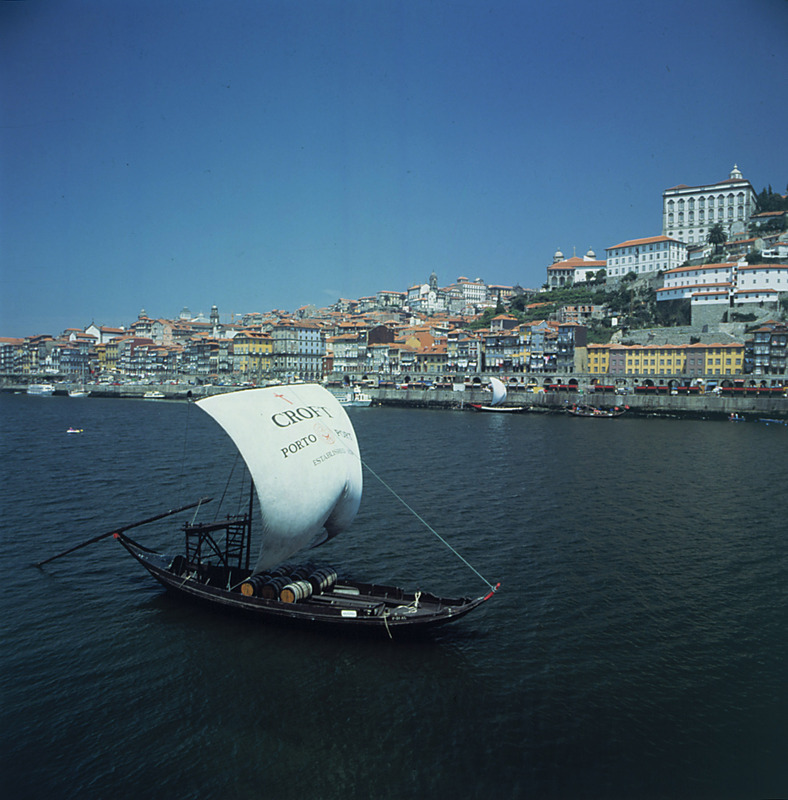 The wine comes used to be shipped down the river from the spectacular terraced hillsides of the Douro valley to Oporto, shipped down the river by distinctive looking boats called ‘barcos rabelos’ . Oporto which lies at the mouth of the Douro river. Vila Nova de Gaia became dominated by British Port wine lodges, with over fifty wine companies based in its narrow, twisting streets many still carry British families names: Barros Gilberts, Sandeman, Robertson’s, Graham’s, Warre’s, Smith Woodhouse and Cockburn’s, The Symington Family, Croft, Taylor etc. 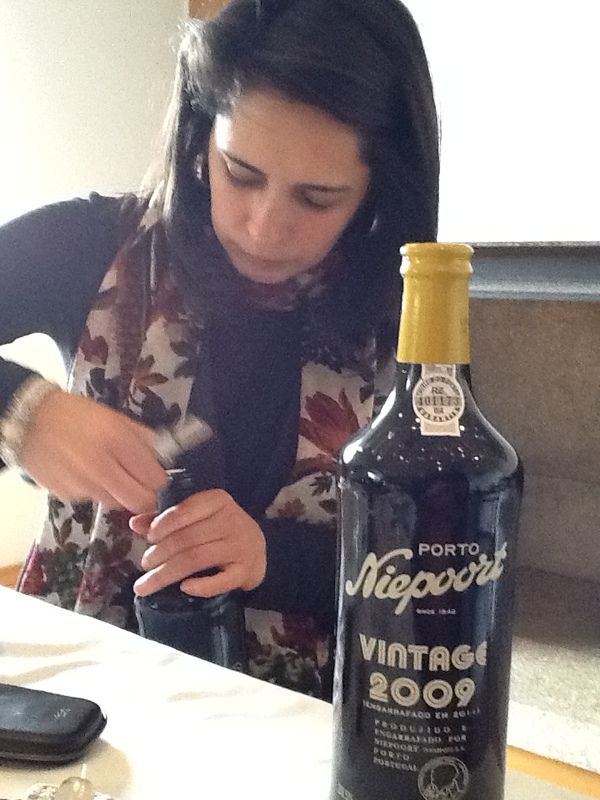 It is here in Vila Nova de Gaia, that aging and blending of most of the world’s supply of Port wine takes place. One of these families (known as Croft), was originally Phayre & Bradley founded over three hundred years ago. The earliest evidence of the firm’s activity as a Port shipper dates from 1588, coincidentally the year of the first ever recorded shipments of Port wine. after its founding partners and took its present name Croft, in 1736 when it was joined by John Croft, a member of an old and distinguished family of Yorkshire wine merchants. In 1911 the House of Croft was acquired by the Gilbeys, the distinguished English wine trade family. It is now owned and run by descendants of two old Port wine families, the Yeatman’s and Fladgate’s. 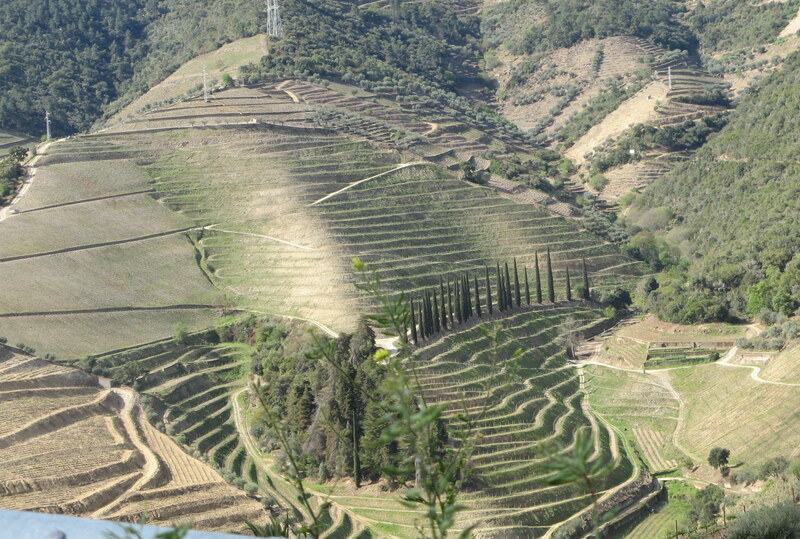 It is those wondrous vineyards: the famous Quinta da Roêda, that are largely responsible to its ownership of one of the finest estates of the Douro Valley, earned for centuries by croft, that keep on ,the place of distinction earned by Croft and its wines. The best and most classic combination is Vintage Port served with a good quality Stilton but also consider blue cheese or a Cheddar, or Parmesan, accompanied with walnuts or chestnuts, in fact nuts of all sorts bring out the best in port. This is all written due to my recent acquisition of one case (of 12 bottles) of Croft 1970) I have has a few bottles of this port in the past (from the Cambridge University cellars yearly “clear out”) and they were simply divine. 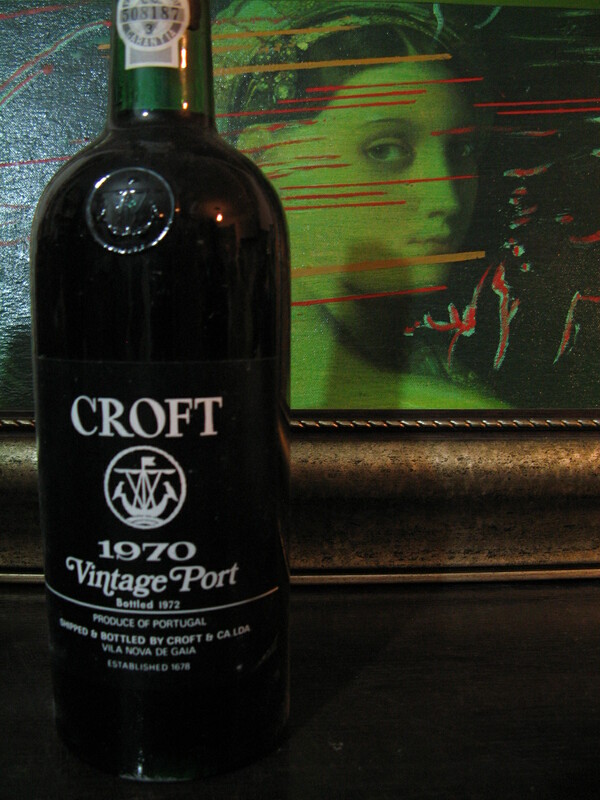 The Croft 1970’s has incredible structure and good acidity and residual tannins to make it last, even beyond 2020. Croft 1970 has a tawny red colour with a touch of deep purple, the nose is delicate and refined. The fruit is still apparent with flavors of dried fruits: sultanas and prunes and touch of tobacco, aand a mixture of dried exotic sweet spices. Some bottles are better than others depending on the cork quality and endurance they tend to start seeping at a certain stage, I am sure it will give me pleasure in the coming years. One of my favorites is a non “pedigreed” LBV (late bottled vintage) from a co-op called Porto Vilanova vintage 1977 (a great Port Vintage year,) which were bottled for me, on different years as the time gone by from 1987 and on, and it got better each time I tasted it and as the years went by and the wine was still “brewing” and maturing in its original Barrel (I shared one whole barrel) and still have some for special occasions. It has deep scent of spiced coffee, chocolate and black prune concentrated prune (Powidl style) taste, simply delicious. Powidła or Powidło in Polish is a plum stew. Unlike jam or marmalade, Powidl is prepared by cooking prunes (for hours) without additional sweeteners or gelling agents just sheer dehydrating, and achieving concentration of the fruit natural sweetness. The plums used should be harvested as late as possible, ideally after the first frosts, in order to ensure they contain enough sugar. The 1937 Port has brownish red appearance with deep amber hue, seducting aromas of vanilla scented tobacco, golden raisins and chocolate gingerbread. The rich, hazelnuts and dark raisins and a touch of fig. There are also: Grahams 1994 LBV, Cases of 1994 Vintage Warre, and Dow’s many more mainly 1977 and 1994 Port to sweeten our lives for years to come..
Now I have to choose which one is my “Festive Port” for this year’s celebrations, I have this tingle at the tip of my fingers and tongue to “go for” the 1963 Barros, This is an LBV in the Best British tradition as Yair says, and LBV’s always surprise you to the better, it is a good Barros Vintage, we’ll see after all I always choose by the guests, atmosphere, and the meal. I will leave you with warmest season’s greetings a a delightful version of this Christmas classic Vintage 1954 by the Drifters. Sweet animation with Santa and Reindeer Singing White Christmas (Animated version), of this Colheita quality Song. judge for yourselves! 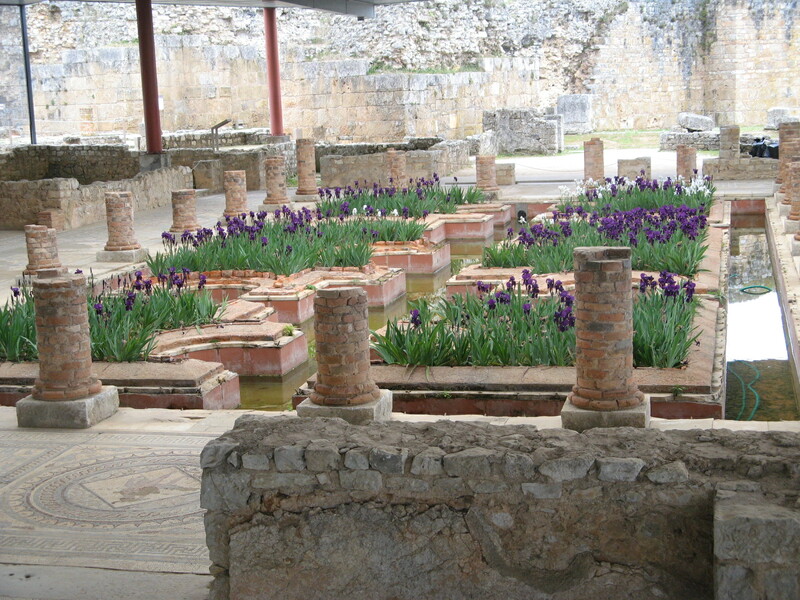 The Romans arrived here a long time before me, around the 2nd Century A.D., conquering the Celtic inhabitants and establishing cities like Conimbrigia Setúbal, Aveiro, Obidos and Lamego to name but a few. 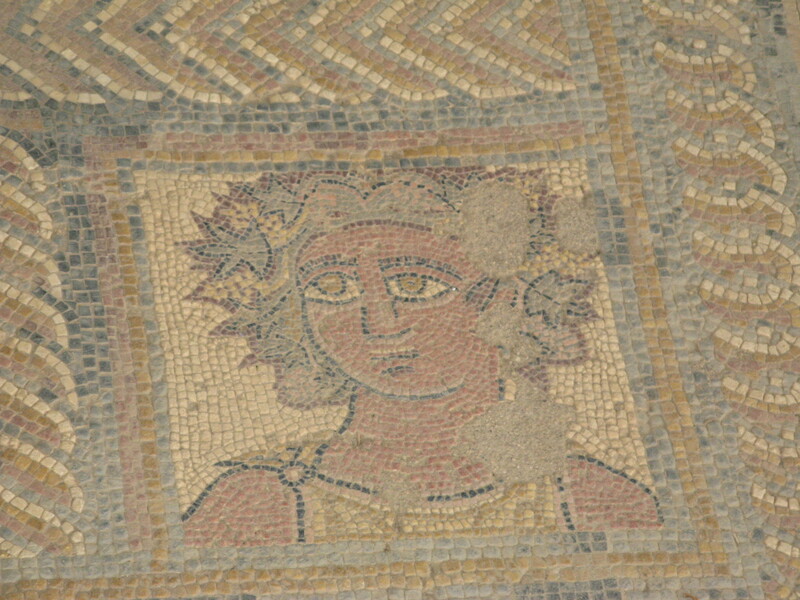 The Romans brought wine and vines with them, and are responsible for introducing some eastern Mediterranean grape Varieties such as Muscatel Graudo, to the Iberian Peninsula. Its distinctive aroma is quite easy to recognize being one of the few grapes whose wine smells like the fresh grapes, plus scents of young raisins, lemons, tropical fruits, lime and citrus bloom. It has good, fresh acidity. Elsewhere in the world, it is known as Muscat of Alexandria, mainly used for sweet, fortified wines, most famous of which is Moscatel de Setúbal with its firm aromas of acacia blossom. We are leaving ancient Conimrigia, the largest Roman settlement in Portugal. 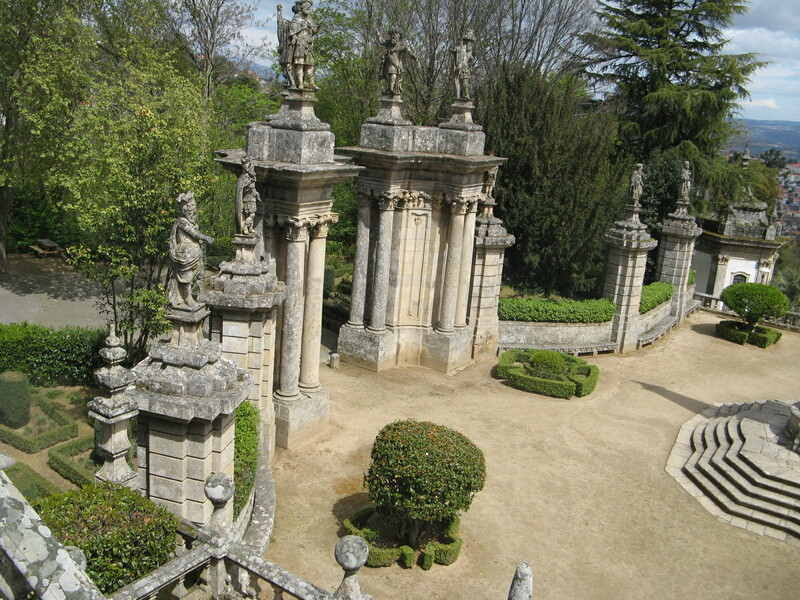 Driving due north and entered through the “gate” to the Northern wine regions of Portugal, via Lamego the small town with the monumental baroque Sanctuary of Nossa Senhora dos Remédios. 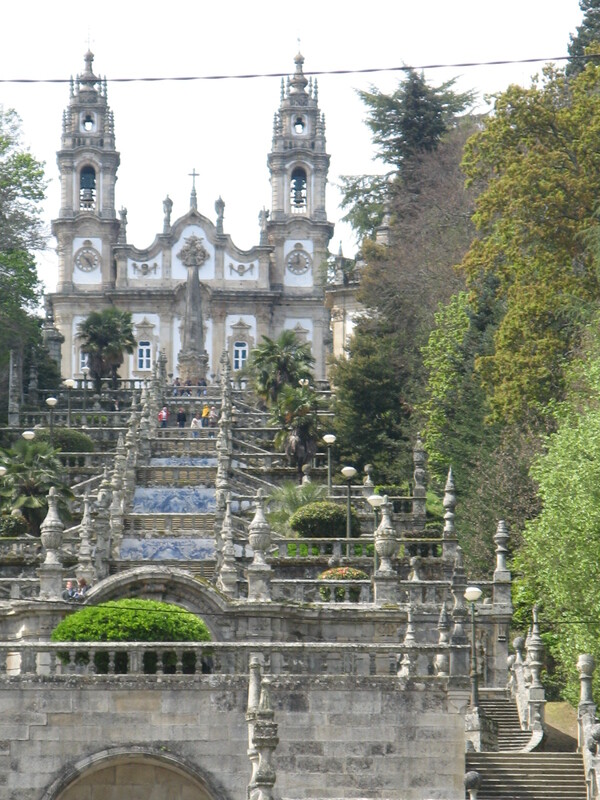 A marvelous granite staircase decorated with tiles, allegorical fountains, small chapels, and statues which lead to a baroque church up the hill. What a wonderful sight, with views all over the town. Next stop Pinhão in the Cima Corgo, one of the three sub regions that form the Duoro wine region. 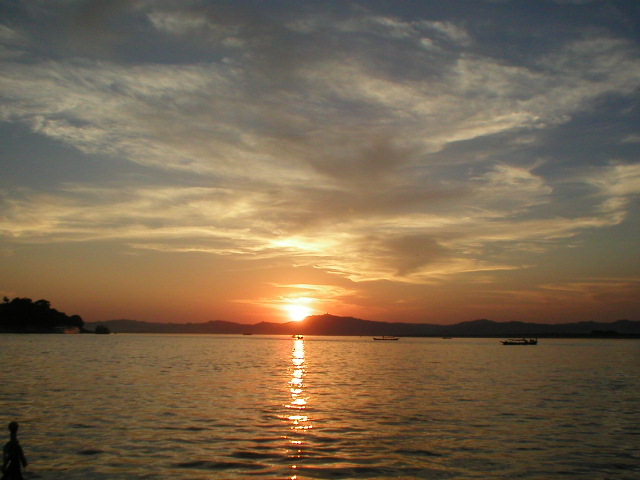 Cima Corgo – Located further upstream from the Baixo Corgo in the west, centered on the town of Pinhão (municipality of Alijó). The rainfall is about 600 mm a year. We’re heading towards the centre of the meticulously terraced Duoro Valley, enjoying the magnificent view of this spectacle: The oldest legally defined (AOC), wine-producing region of the world! 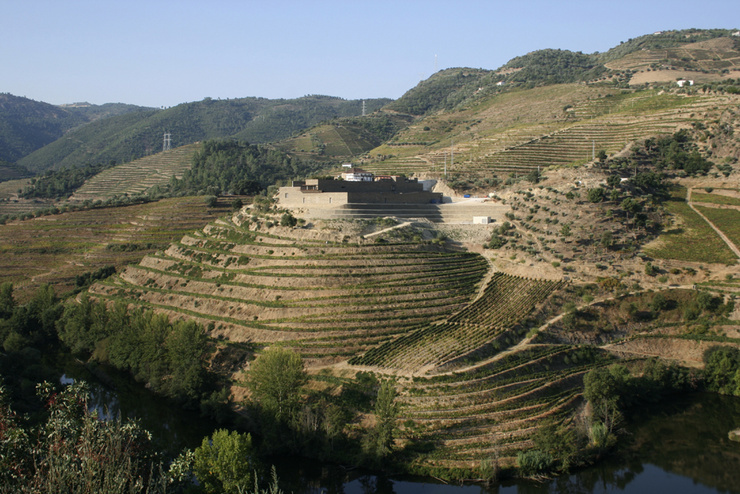 As a local saying goes, “God created the Earth and man created the Douro”, with its dramatic landscapes on the steep banks of the river created over centuries of human cultivation, made up of carefully terraced vineyards of the home of port wine. the Douro Valley is breathtaking with its hills covered with terraces of vines falling down steeply all the way to the river banks. 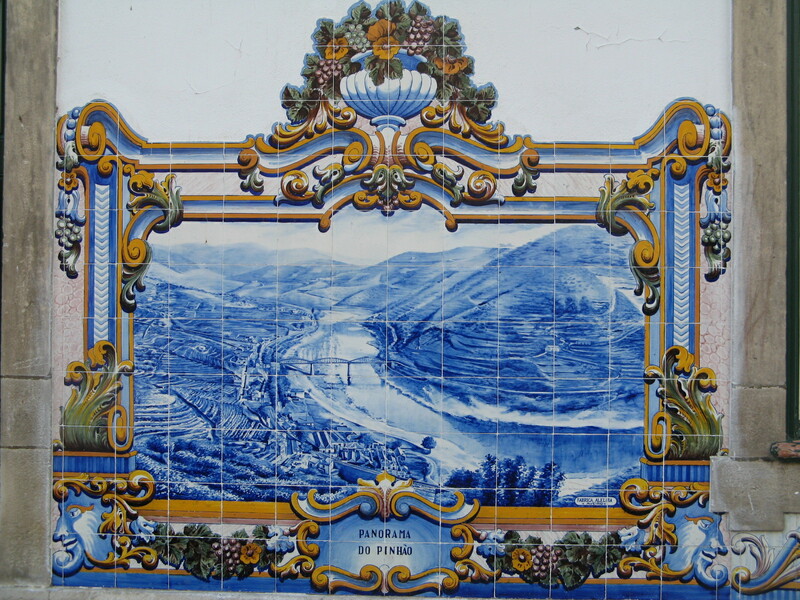 The Douro River originates in Spain and flows west in the north of Portugal until it reaches the ocean in the town of Porto. 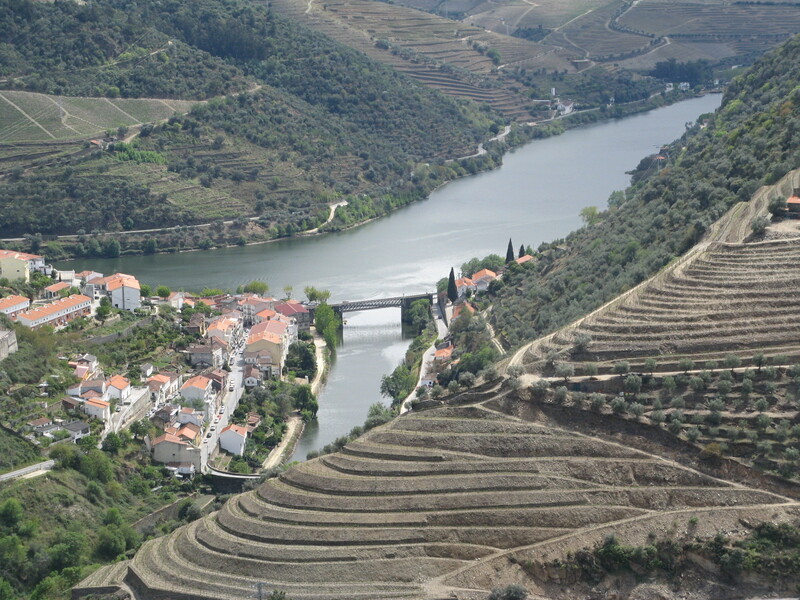 Today we enjoy the view and some wine and Port from various producers, and a good rest in The splendid C S VINTAGE HOUSE HOTEL, on the river bank in Pinhão, tomorrow we are invited to a visit at Quinta de Nápoles Just outside the town of Pinhão. It is one of Niepoort’s acquisitions of own vineyards, with wineries adjacent to them. We cross the river to the north bank. 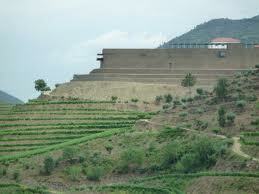 The winery building designed by Austrian architect Andreas Burghardt, is camouflaged in the terraced hillside. Grapes travel a short ride from the vineyards to the reception area, which is the “roof” of the winery, and from there brought down the four floors of the building. Everything is there from the clusters stage start to the finished wine stage in the basement. It seems to fulfill Dirk Niepoort’s wine making philosophy. It enables a close watch on quality control of the wine, on the wine drop level, rather than the bulk Juice that starts in the “lagares”. (A lagare is the traditional container made of granite or cement where grapes are foot pressed for juice extraction). 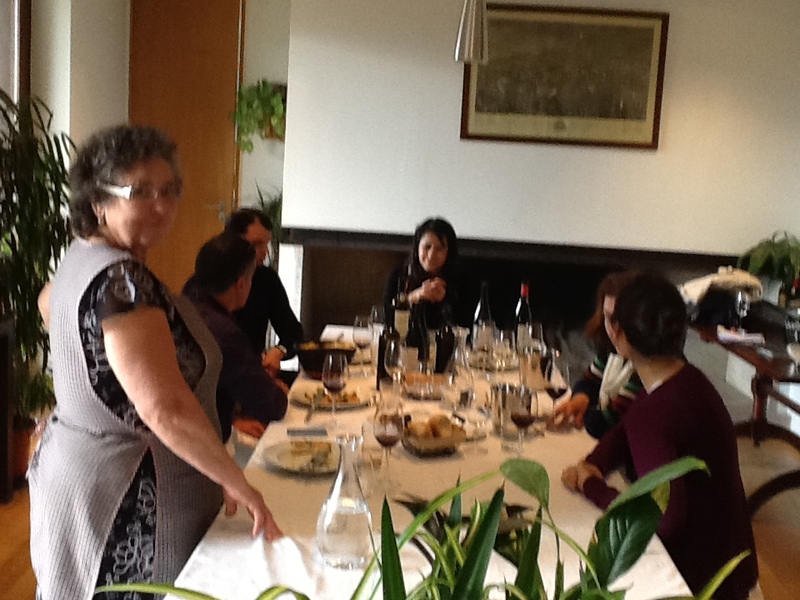 As our hosts Gabriela Santos and Carlos Raposo emphasized, that owning Quintas and vineyards in the Douro was an important step in the continuation of the port wine tradition and the first step for the creation of Niepoort table/dry wines. 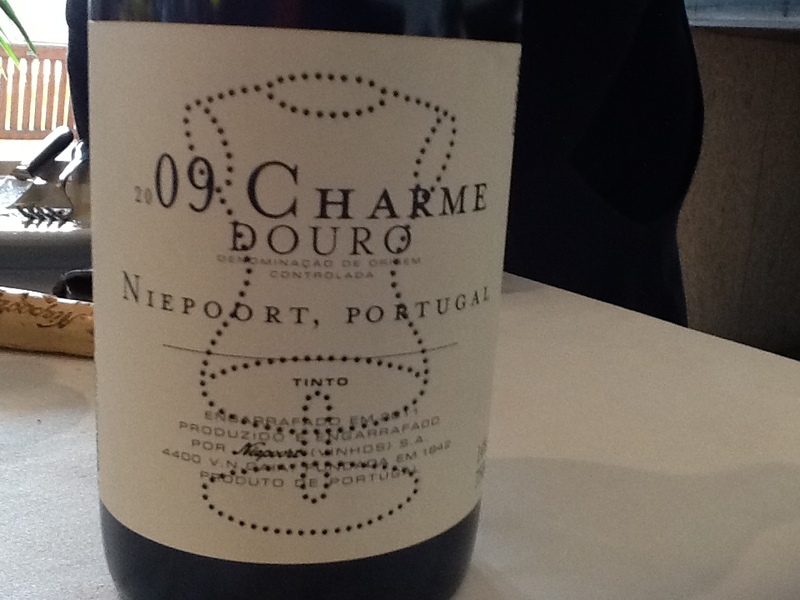 Niepoort is now at the top of Douro winemaking, I guess this is because he originates from the love of excellent wine in general, placing him amongst the leaders of the new generation of quality winemakers who combine the best of both the world, that of 350 years old local tradition with a desire to produce world class wines. Some of which we will taste shortly from the barrels and from the bottled past vintages. Till today Niepoort, was in my mind, the winery that produces the best Colheita Ports and as it turned out it produces serious and sophisticated dry red and white table wines. I will not bore you with the laborious job of barrel tasting we did in the barrel cellars, some of which were absolutely surprising to me as a novice to those Portuguese grape Varieties for whites: Rabigato, Codega do Larinho, Arinto, Gouveio and Viosinho, for reds: Tinta Amarela, Touriga Franca and Nacional, Tinta Roriz, Tinto Cão, and several others. The region’s geology of mica slate and schist’s soils of the region, the usually harsh climate and the fact that most wines are made from old age vines 60-100 years old and that all wines are blends. Here is where the secret lies, and the Art shows. 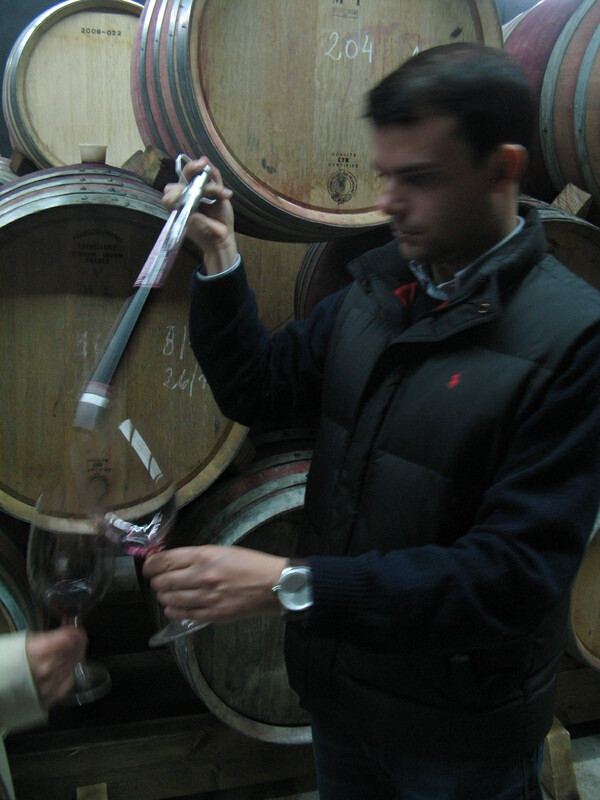 Lead by the winemaker at Quinta do Nápoles Luis Seabra. The aim is for blended wines which sum up to much more than their separate parts, and it works! 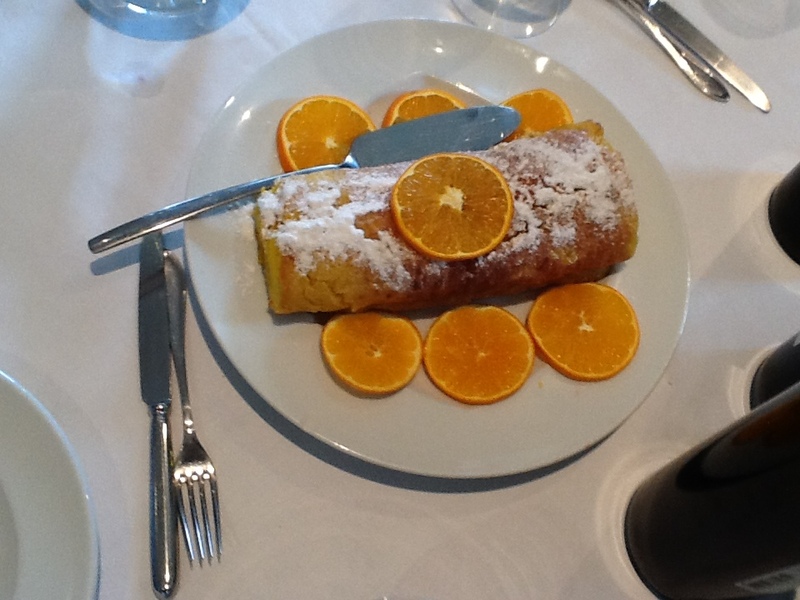 Food is prepared with love and attention by the Quinta’s cook Maria José da Fonseca Mansilha. 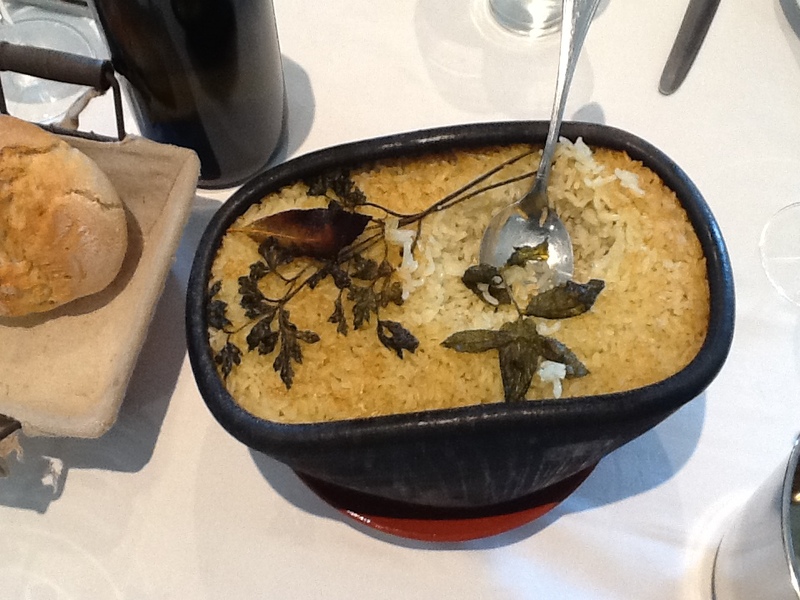 Who cooks and serves and over sees the lunch country style fare meticulously presented as you can see. With us set to the table Paulo Dinis Barreto the owner of EnoMania wine Distributor from the Isle of Madeira and his friend . We move on to the more complex Coche 2010 a great wine with substantial character, Coche shows intense red grapefruit aroma with a touch of fresia floral notes with multiple layers of flinty mineral touch. A very long multilayered finish on the palate. A wonderful wine! First, the Vertente 2009. It has deep and cloudy purple color. 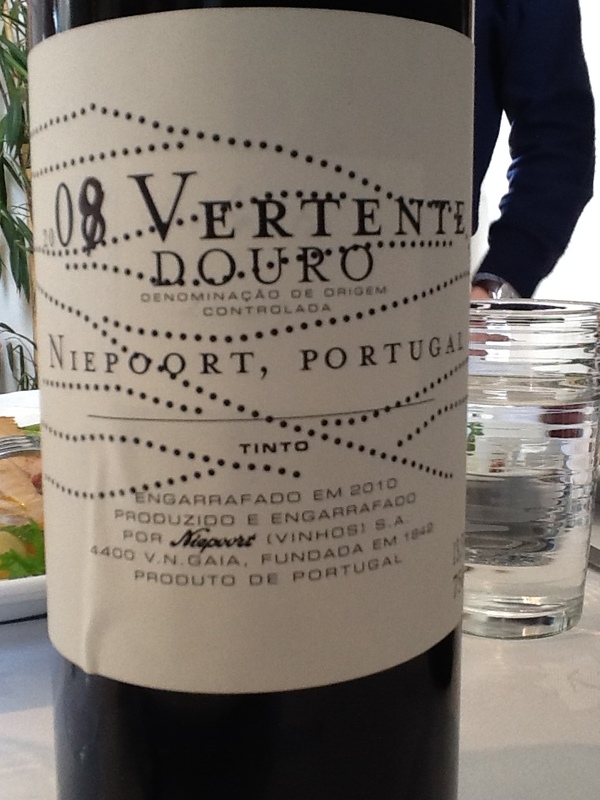 Red and black fruit aromas, a touch of green pepper with mineral finish. Good balance, and elegant but powerful fruit with great freshness. The tannins are firm but not obtrusive. Will keep for another 5-6 years and even improve as the tannins round up. Than came the Charme 2009 although quite Dark in color, the first thing that comes to mind when you sniff in the earthy mushroomy aroma is Bourgogne and it may well be what was on the blenders mind as the wine evolved. Even after 14 months in the barrels not every barrel is chosen to be bottled as Charme. There is an aim here and if not reached the wine will be used in other blends. The Charme 2009 is rich and elegant, with dark cherry, plums compote aromas, deep wet earth, mushrooms and a touch of truffles aroma engulfs the palate, the wine is totally hedonistic aimed at the pursuit of pleasure in the same manner a good Époisses de Bourgogne is. The finish is long with extremely good balance; tannins are well integrated and appear soft but will keep the wine for at least another 10 years. This was my favorite wine of our lunch/tasting. But the most characteristic of the region in my mind is the Redoma Tinto 2009 Dark in color Mainly ripe black fruit aromas, with plenty of dark plums, a strong aroma of mint and thyme and of wet forest leaves. Flint stone touch and good tannic touch turning velvety well balanced with good acidity and fruitiness. The wine is very expressive almost extrovert, and rich, with very long and persistent finish. A wine true to its origin and Paulo’s favorite of the reds. The Neipoort Vintage Port 2009 (Paulo’s preference for dessert). The color is deep ruby blood red, and the aroma is all about sensuality, with freshly ground mixed sweet spices of cinnamon stick with cloves and English pepper with green cardamom. On the palate, amazing presence of huge tannins and high concentration of ripe re and black forest berries, very powerful but elegant, which is so well balanced that it seems it may keep forever (almost). I would buy a case to keep for my grandchildren and the generation to follow. And the Neipoort 2001 Colheita (my choice for dessert). Colheita’s are tawny Ports matured in wood for at least 7 years but most are taken even further before bottling. In Neipoort the grapes were trodden (by feet) in cast cement lagares and later the port is matured in small old oak casks. 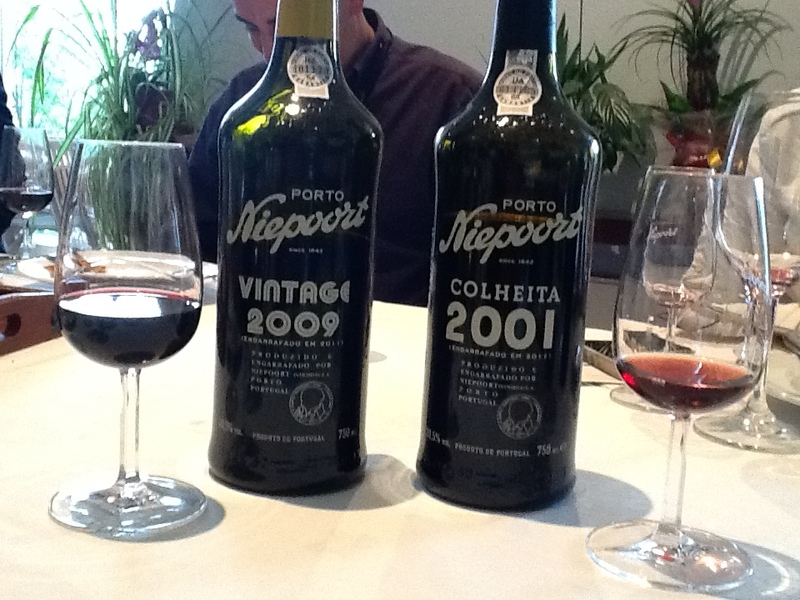 Colheita Ports are Tawny Ports from a single vintage year. 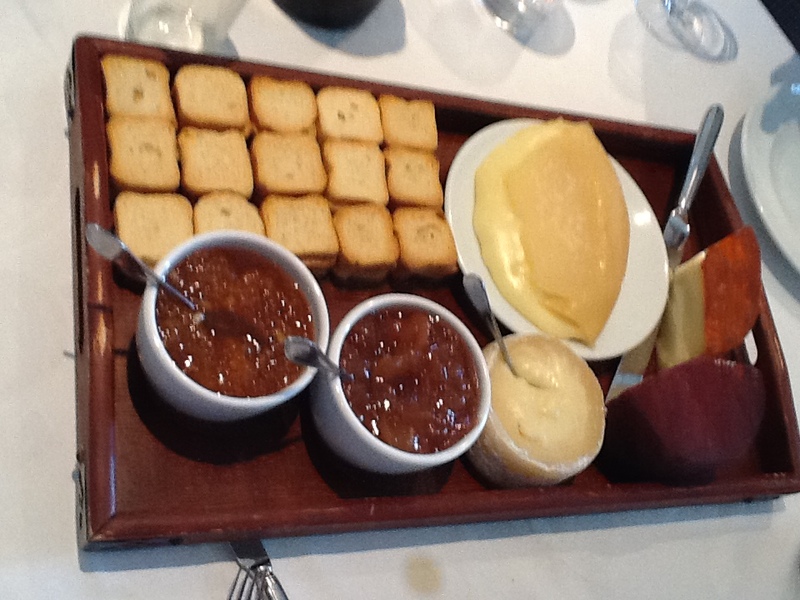 We had the Ports with the amazing cheeses and Marias Orange cake. And had to excuse ourselves we still had 2 hours drive to Porto and a fair amount of alcohol in our blood. Vilanova de Gaia looked a far reach But tomorrow we have a plane to catch to London where for ages these wines headed across the ocean and the English channel to it’s destination on the London Docks. We parted our wonderful hosts sorry we were not staying in the region for at least another day with the magic taste of the Ports still lingering on our palates.